TotalSim use, resell and develop CFD software. Having efficient and accurate CFD software is key to our CFD consultancy business. We chose the open-source CFD software OpenFOAM®**, as the backbone to our CFD company. Key to this choice was the open nature of the code, no annual licensing fees and the potential accuracy of the CFD simulations. 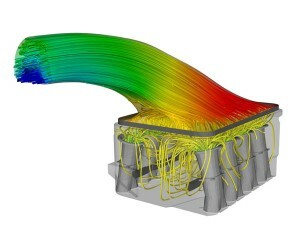 OpenFOAM®** is an extremely powerful CFD solver, which is capable of modelling nearly all fluid problems. From marine to automotive applications. OpenFOAM® could replace your existing CFD software, providing a cost effective and accurate replacement to other commercial solvers. To find out more about OpenFOAM®** please follow the links below. We are also resellers for Sculptor® software, which is fundamental to our CFD optimisation process. TotalSim and many of our support customers use Sculptor to deform geometries and optimise products. TotalSim are big users and developers of the opensource CFD code OpenFOAM®**. Click here to find out more. Sculptor® is an extremely powerful CFD and mesh deformation software package. Click here to find out more about the deformation software Sculptor®. Please click of the relevant CFD software links above or contact us to find out more. TotalSim’s engineers are vastly experienced in the field of Computational Fluid Dynamics. Between our engineers we have used all of the main commercial CFD solvers and converged upon OpenFOAM®**. We are happy to share all of our experiences with different CFD solvers. Please contact us to discuss you CFD needs and how TotalSim can help you develop your own CFD solution.